Thanks for stopping by. Inspired by Alison Hall's plaque on PaperArtsy's blog, mainly because I love the colours, I decided to make one with a particular friend in mind. The theme is all about paint, an excellent excuse to get out the Fresco Finish Chalk Acrylics. First some grunge paste was added to mount board and when dry painted with snowflake and chalk paint. Pieces of patterned paper were glued on. Some masking tape was painted in patches with bora bora, wording stamped in snowflake and pieces added to the paper. Splatters of eggplant and beach hut were added by flicking a paint brush. More script was stamped in cobalt Archival Ink. Gelatos were added to the edges and very lightly over the Grunge Paste. Treasure Gold was used to add highlights. The flower was stamped repeatedly and painted with washes of beach hut and eggplant. The flowers were layers up, with one flower cut smaller. Treasure gold was added to the tips of the petals, gold pen added to the centres with a pearl gem. The sentiment was stamped in Archival Ink, coloured with paint wash and adhered with Multi Medium. 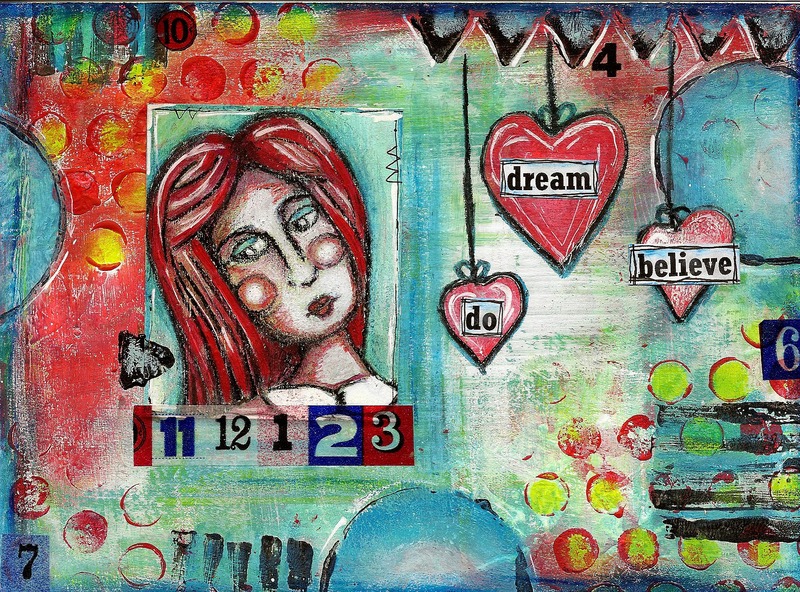 I'm entering this in PaperArtsy's Challenge 3 - Paint. Thank you for taking the time to look. I really appreciate all of your comments. 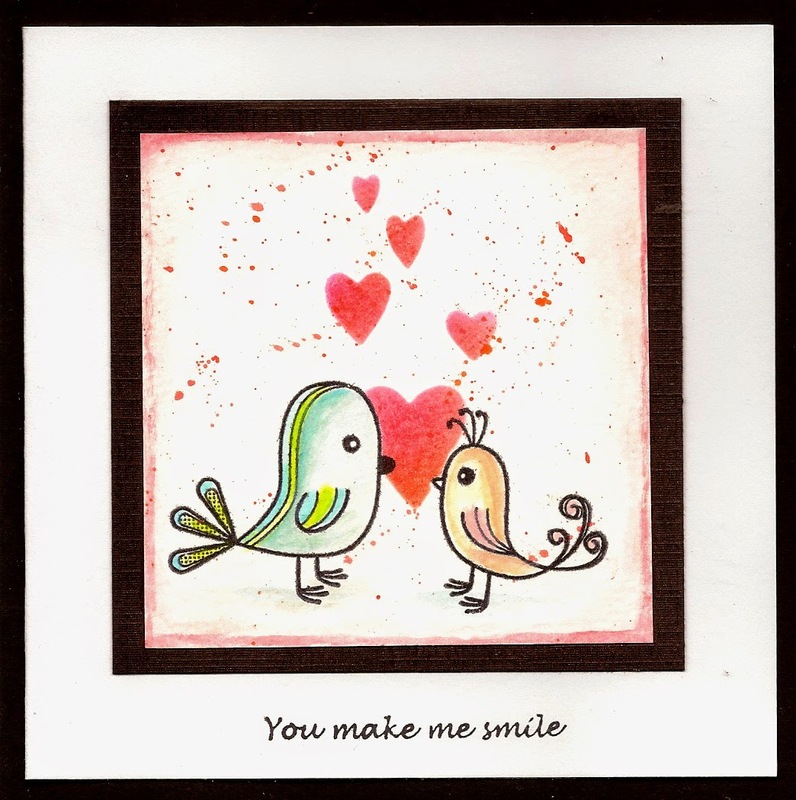 A little card for my lovely husband who bought me the bird stamps for Christmas. Not a lot of time for crafting or blogging at the moment but here's a little something with a Valentine's flavour. The heart is made with grunge paste through a Tando stencil, which is why it was difficult to get it all in focus. 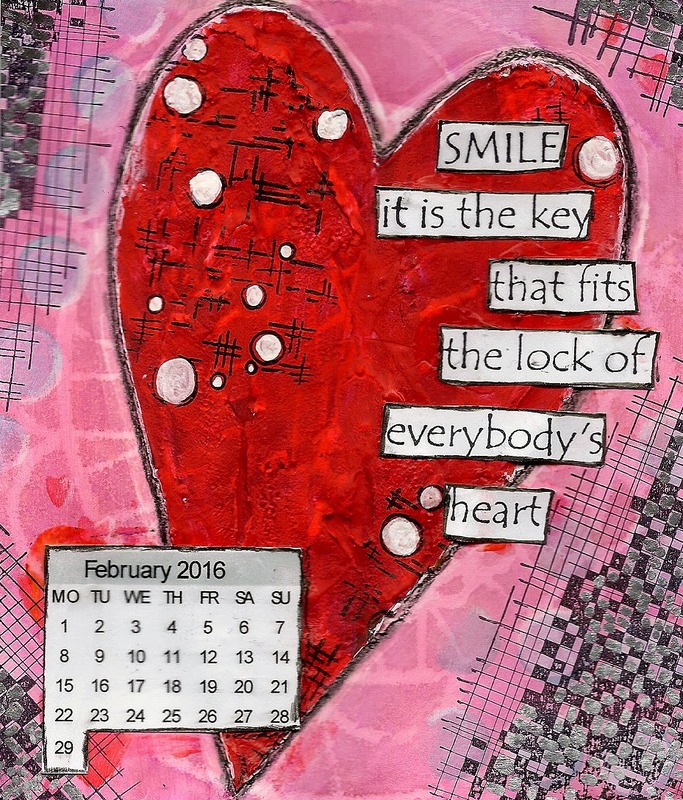 The Craft Barn calendar challenge for February is Red and Hearts...I'm hoping I can get away with one heart! Thank you for taking the time to have a look. This week's challenge at The Craft Barn is Mini Albums, so I thought it was a great excuse to photograph a little album I made a while back. A friend in South Africa, who is in to scrapping, sent me a BoBunny Enchanted Mini Edgy Album which was perfect to compliment the snowy scenes. Fortunately the photos only capture how pretty it was and not that it felt like -10C in the wind. It was a magical weekend. I've not had much time for crafting in the last month but with less than 24 hours to go I decided to make something for the PaperArtsy Challenge - Shiny Stuff. Inspired by Trish Latimer's post I decided to make something with copious amounts of Treasure Gold in different guises. I started by melting some glue with a glue gun, and pressed in to it a flower stamp which had been lightly smeared with vaseline to help it release. When cool, I cut out the petals and covered them in classic treasure gold. I covered two edges of a piece of card stock with a thin layer of grunge paste. On the left a brick stamp was repeatedly pressed in to the past and on the right a script stamp to add a little texture. Then I experimented with some Fresco Finish chalk paints for a background. I stenciled on some leaves but later changed my mind and painted them out. Some script was stamped in distress ink and the flowers were stamped in Archival ink. The flowers were outlined with a Stabilo All pencil. Some more stamping was added to the background. Treasure gold was lightly rubbed over metal butterflies to highlight the design. More treasure gold was used to highlight the painted grunge paste. Some extra lines of treasure gold were added with the edge of a credit card. Gold microbeads were added to the centre of the flowers with a little extra higlighting of course. Finally I decided against the painted red stamens and added some metal nailhead stickers for a final bit of bling. Definitely shiny stuff. Thank you for stopping by. Why not pop over to the PaperArtsy blog to see some of the other entries?